Partner with the No. 1 company to start your own business in Green Energy and see your business grow and earn profits! 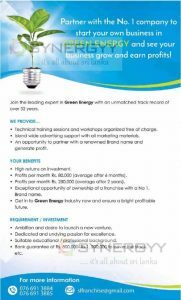 Join the leading expert in Green Energy with an unmatched track record of over 32 years. Technical training sessions and workshops organized free of charge. Island wide advertising support with all marketing materials. An opportunity to partner with a renowned Brand name and generate profit. Profits per month Rs.80.000 (average after 6 months). Profits per month Rs.250,000 (average after 2 years). Get in to Green Energy Industry now and ensure a bright profitable future. Ambition and desire to launch a new venture. Dedicated and undying passion for excellence. Suitable educational / professional background. Bank guarantee of Rs. 800,000- Rs.1,200,000 to cover the stock, etc.